Do you need extra help for EL students? Try the Picture Strategy pre-lesson. Explain to students that today we are going to look at a variety of spring-themed pictures and use them in a math lesson on subtraction. Draw a variety of spring-themed picture math problems (e.g., five rabbits, a minus sign, four rabbits, and an equals sign) on the board. Call on students to come up to the board to practice writing an equation that matches each set of pictures. 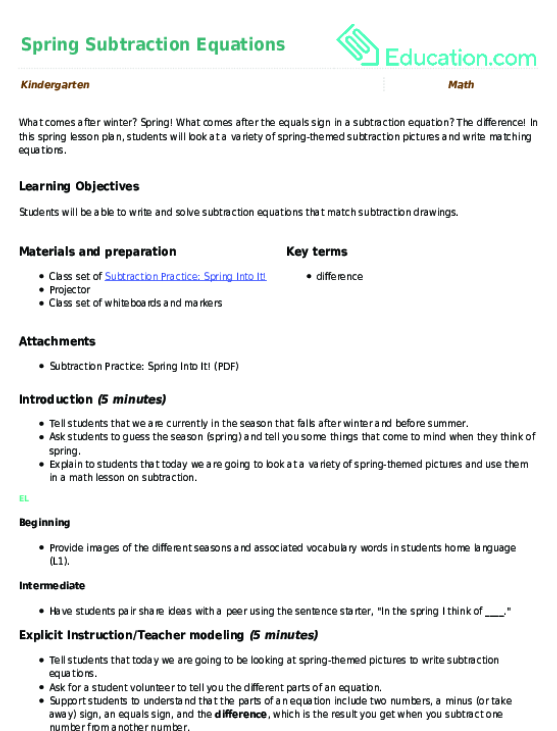 Project the Subtraction Practice: Spring Into It! worksheet onto the board. Hand out the Subtraction Practice: Spring Into It! worksheet for students to complete independently. Provide math counters for students to use as needed. Create an equation template (e.g., ____ – ____ = ____) for students to use as they are writing equations during Independent Work Time. Can you subtract all the veggies in these equations? 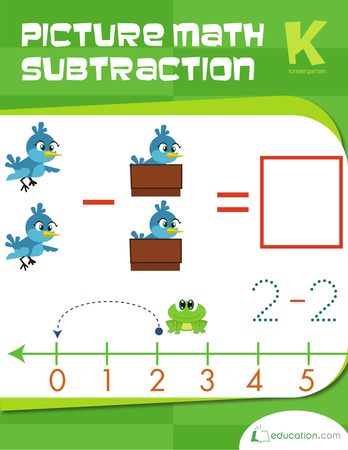 Practice simple subtraction with your kindergartener. 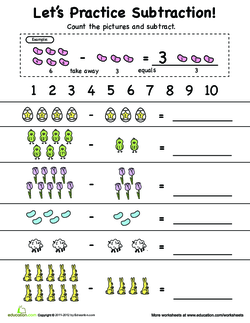 Start off subtraction with some picture equations, perfect for helping your child understand a new math concept. Help her by practicing simple subtraction equations. Use these fun toy themed math problems to assess your students’ ability to solve addition and subtraction problems within 20. Use these fun fruit and vegetable themed math problems to assess your students’ ability to solve subtraction problems within 20.